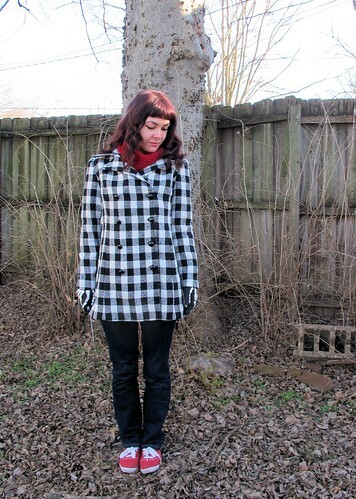 It’s been a couple of months in the making, but I’m happy to finally announce that my plaid coat is finally finished! My pattern, a vintage Vogue pattern from the 70s, included everything I needed in the instructions to get the coat fully tailored. I also consulted my favorite tailoring book to help me with a few things that weren’t included in the pattern – such as drafting a back stay. 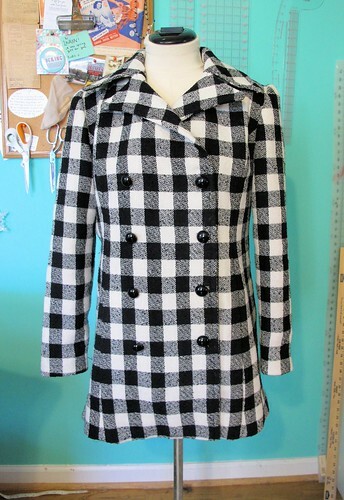 I picked up my black and white plaid coating from Mood Fabrics a few months ago, which was the initial inspiration for this coat. Since the fabric has a very soft body to begin with, I knew it wouldn’t stand up well on its own for all the madness that goes into tailoring a coat. I decided to underline every piece with silk organza, except the facings, which are interfaced with a medium weight fusible. The fronts of the coat are interfaced with hair canvas, the collar and lapels are padstitched with silk thread and lots of steam, there is a muslin back stay, and the hemline is interfaced with bias strips of hair canvas. Whew! Just writing all that makes me feel tired again. You can see my progress posts on this coat here and here. Since coat is only underlined with the silk organza, it’s not exceptionally warm – I wouldn’t try to wear it to, say, hike up a mountain or anything. But it is perfect for the mild winters here in Tennessee, especially since most of my going-out involves walking from a heated car to a heated building! 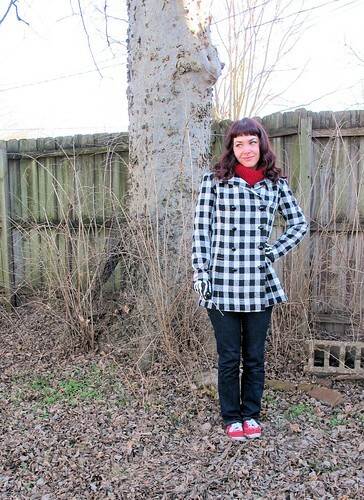 I actually took these pictures on an uncharacteristically cold day – I think it was around 25 degrees at the time. Ouch! My coat stayed nice and warm, though, so bonus for me! For my lining, I chose a gorgeous silk charmeuse in a brilliant, shiny red. I LOVE how this turned out – I think it really steps up the coat game and makes it look totally luxe! Plus, I don’t know about y’all, but I’ve never owned a coat with silk lining before now. Feels pretty freakin’ fancy! 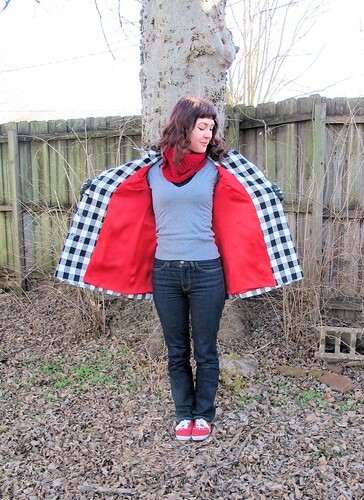 I originally waffled pretty hard on my lining choices – I generally go with Bemberg rayon, which I love love love, but I wasn’t loving the colors on the website and I felt like trying something new. I also briefly considered China silk, but ultimately decided it was too lightweight for something that will get pulled off and on constantly. Silk charmeuse is wonderful because it has a nice body and doesn’t slip around much – making it easy to cut and sew. Plus, it’s so shiny! I don’t think I’ll ever get tired of looking at that rich color. I finished my coat with topstitching – using a proper topstitching thread in the needle, so it would be really visible – and black glass buttons in bound button holes. 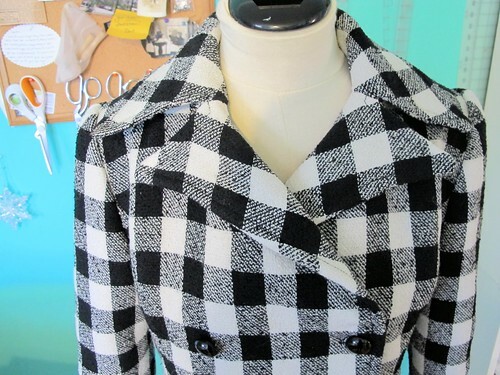 Making this coat was fairly easy, just time-consuming. The fabrics were not hard to work with – the most difficult part about the plaid was cutting all the pieces to match, princess seams and all. I think that alone took me close to three hours! My only advice for that sort of undertaking is to take your time, don’t rush, and cut everything on a single layer to ensure accuracy. Once the pieces are cut, though, it’s pretty easy to match them up and go from there. 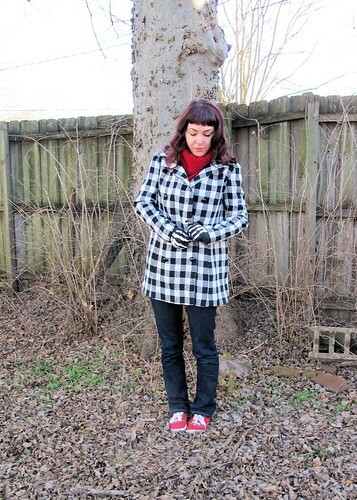 If you’ve ever toyed around with the idea of sewing up your own coat, here’s my advice – DO IT. 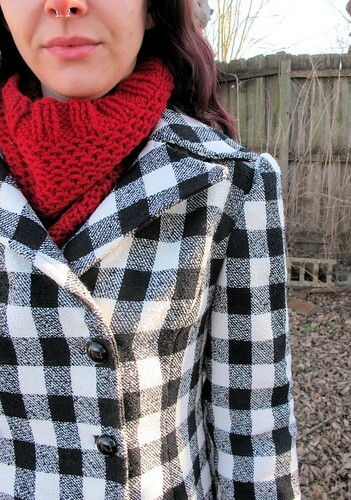 It’s so fun, a little addicting, and you really can’t beat how wonderful a hand-tailored coat feels when you wear it.